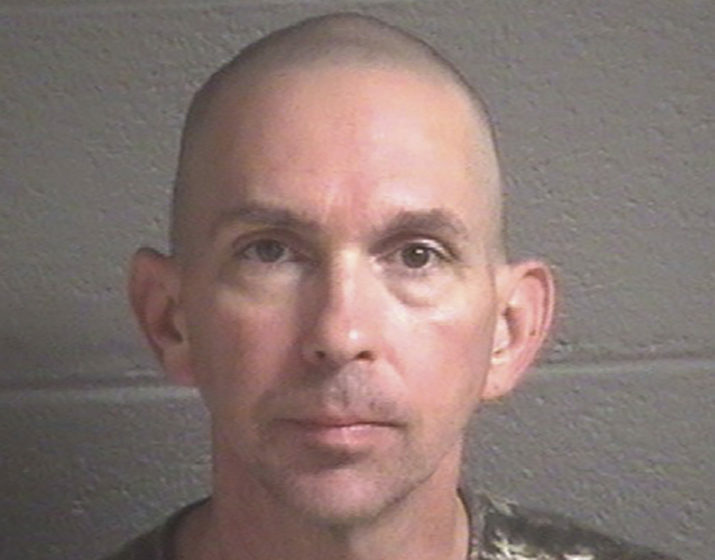 Michael Christopher Estes is accused of planting an improvised explosive device Oct. 6 at the airport in Asheville, N.C. In this week’s Hate Report: Three white men have been charged with building bombs recently, the FBI’s much-awaited hate crime stats show an uptick, and a white supremacist campaign helped elect a black town board member. Last week, prosecutors announced federal charges against Elijah Blankenship of Akron, Ohio, who was found with a pipe bomb in August, a few hours before a planned vigil for victims of the violent white supremacist protests in Charlottesville, Virginia. Earlier this week, Christopher S. Langer of Florida was found to have been making bombs in his home. The local sheriff said Langer hated the government and planned to use a grenade on first responders. “He has all the components in there to make a weapon of mass destruction,” the sheriff told local media. The story didn’t go viral and Trump didn’t tweet about it because the bomb was not placed by an immigrant, or a Muslim, or a Mexican. A Muslim attacker’s mugshot would become a meme across the conservative media. Mainstream American outlets would be covering the heroic bravery of those who thwarted the terrorist plot. … In this case, though? Crickets. We hear nothing at all — almost exclusively because the man who planted an improvised explosive device, just like ones that have been used to murder and maim people all over the world, was white. These kinds of right-wing domestic terrorists were behind nearly twice as many violent plots as Islamist terrorists in the United States in the last nine years, we found earlier this year in our investigation with The Investigative Fund. But law enforcement sting operations were much more likely to be focused on Islamist terror. That highlights another major issue: Under President Donald Trump, the country’s domestic terrorism efforts appear to be crumbling, according to an op-ed piece in The Washington Post this week. As we have detailed in The Hate Report, the Trump administration has dismantled the Countering Violent Extremism program, which aimed to tackle potential terrorists via grassroots organizations. The 2018 budget also defunds $10 million in grants for the Department of Homeland Security’s Office for Community Partnerships, which similarly aims to target homegrown terrorists like the men above. It’s critical that the U.S. government engage those communities in the homeland from which terrorist organizations may seek to recruit. I’m concerned that these efforts are atrophying. On Monday, the FBI released its annual Hate Crime Statistics Report, which catalogues bias-motivated criminal incidents across the U.S. for 2016. It showed the nation’s law enforcement agencies reported 6,121 incidents motivated by race, ethnicity, sexual orientation, gender identity, ancestry or disability. That’s a nearly 5 percent increase over what was reported in 2015 and a 10 percent jump from 2014. Compared with estimates based on surveys from the Bureau of Justice Statistics, the FBI’s figures vastly underrepresent the full scale of hate crimes nationwide, likely due to 88 percent of law enforcement agencies not reporting a single hate incident to the FBI in 2016. Even so, the report is illuminating. About 58 percent of cases were motivated by race, with black people being the most frequent victims. Twenty-one percent were motivated by religion, with Jews making up the largest share of victims in that group. The most dramatic increase, a 25 percent jump over the previous year, occurred in the last three months of last year. As CNN notes, there’s usually a significant decrease in hate crimes during final quarter of the year, but 2016 was an exception. These figures add fuel to the idea that Trump’s campaign played a role in unleashing a wave of hate. Anglin and his ilk like to talk about the Overton Window, a term that describes the range of acceptable discourse in society. They’d been tugging at that window for years only to watch, with surprise and delight, as it flew wide open during Donald Trump’s candidacy. Suddenly it was okay to talk about banning Muslims or to cast Mexican immigrants as criminals and parasites – which meant Anglin’s even-more-extreme views weren’t as far outside the mainstream as they once had been. Anglin is currently on trial for facilitating a mass harassment campaign against a Jewish family in Montana. Since the trial began in April, Anglin has made himself scarce. The people suing him haven’t been able to find him to serve him with the lawsuit. He insisted he was living in Nigeria, but we debunked the evidence he provided to prove it. Without showing up to mount a defense, Anglin faced the possibility of having the judge simply rule against him, forcing him to pay damages to victims. However, on Tuesday, Anglin’s legal team finally filed its first motion in the case – meaning Anglin’s side appears willing to push back against the allegations. The case not only could set important precedent about whether trolls are liable for the emotional pain they cause, but also has the potential to push The Daily Stormer off the internet for good. We reached out to Anglin’s lawyer, Matthew Stevenson, for comment but did not receive a response. A man selling the homeless advocacy newspaper Street Spirit was punched in the face while trying to protect a lesbian couple in Berkeley, California. The couple and their 10-year-old daughter were waiting at a cafe when a homeless man started threatening them. When none of the other patrons stepped up, Berkeleyside reports, the newspaper vendor confronted the attacker. The family had moved to Berkeley from Charlottesville, Virginia, five years ago, hoping to escape the prejudice they said they encountered there. A lesbian couple in Los Angeles was targeted and assaulted Oct. 30. One of the victims, Sabrina Hooks, suffered a black eye and broken tooth. “The best I could describe, it was like a horror film,” she told Fox 11 News. Trevon Godbolt was arrested after allegedly stripping another man of all his clothes and possessions, leaving him to walk the streets of Muskegon Heights, Michigan, naked and alone. As Fox 17 reports, authorities believe the victim was targeted due to his sexual orientation. If America knows how to do one thing really well, it is to capitalize on current trends to make money. It turns out the division among Americans, and the corresponding hate, is no exception. The shirt has since been removed from the site. 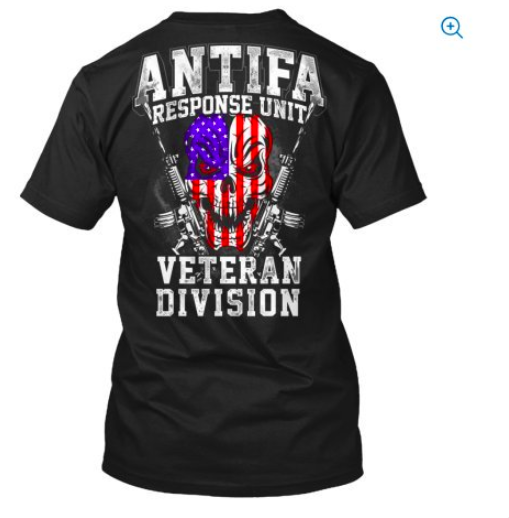 But it’s not just those who hate the antifa who can get their sloganed clothing ready-made. 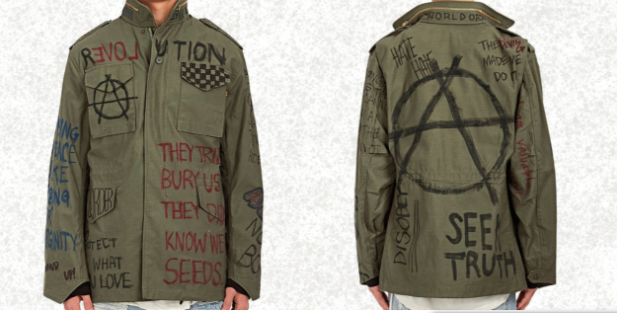 Barneys New York has been lambasted in recent weeks for selling a jacket inspired by the antifa movement. 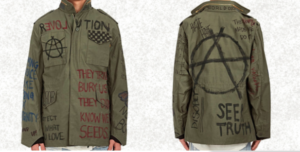 Adorned with slogans such as, “Protect what you love,” and anarchist logos, the jacket has since been taken off the Barneys website, but we have a photo, courtesy of The Daily Dot. Oh, and the price of this jacket? $375. Earlier this month, Kevin Beckford became the first African American elected to the Town Board of Pittsford, New York. Beckford’s path began last year. After white supremacist fliers appeared around town, he joined a protest march. During that march, Beckford asked organizers how he could help. Together with the march’s organizers, Beckford founded the pro-diversity group PittsForward, which became a jumping-off point for his run for Town Board. Despite meeting some racist resistance, such as having his campaign website hacked and warnings from local police about being targeted for racial violence, Beckford emerged victorious. Corrections: A previous version of this story misstated Charlottesville’s location. It is in Virginia. A previous version also misstated the date and location of an attack on a lesbian couple. It occurred Oct. 30 in Los Angeles. A man selling the homeless advocacy newspaper Street Spirit was punched in the face while trying to protect a lesbian couple in Berkeley, California. The couple and their 10-year-old daughter were waiting at a cafe when a homeless man started threatening them. When none of the other patrons stepped up, Berkeleyside reports, the newspaper vendor confronted the attacker. The family had moved to Berkeley from Charlottesville, Virginia, five years ago, hoping to escape the prejudice they said they encountered there. A lesbian couple in Los Angeles was targeted and assaulted Oct. 30. One of the victims, Sabrina Hooks, suffered a black eye and broken tooth. “The best I could describe, it was like a horror film,” she told Fox 11 News. Trevon Godbolt was arrested after allegedly stripping another man of all his clothes and possessions, leaving him to walk the streets of Muskegon Heights, Michigan, naked and alone. As Fox 17 reports, authorities believe the victim was targeted due to his sexual orientation.